If a Pisces man is into you, he’ll show his interest in a variety of ways. This is a deeply intuitive and romantic sign, so expect an emotional connection, right from the start. He might gaze soulfully into your eyes, or display an unusual amount of compassion as you tell him about a problem you’re experiencing or a difficult experience you had. As his attraction progresses, he’ll find creative ways to woo you — reading you love poems, perhaps, or sharing with you a piece of art or music that he made himself. But the key to Pisces’s attraction truly lies in his eyes — the way he looks at you with his whole, open heart apparent in his gaze. When he starts showing you how deeply attuned he is to your needs and feelings, that’s when you’ll know you’ve got him hooked. As a Pisces, your flirting style is predominantly magnetic, mystical, and sensual. Pisces people are in tuned with their emotions. These folks are generally shy, but they are noticeable. When the Pisces finally opens up, their words reverberate like shark gliding on the shore line. Their presence is powerful and mysterious. 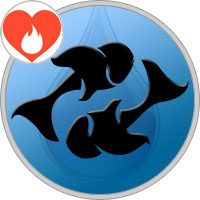 Prospects are attracted to a Pisces’ sensuality and intelligence. They are nurturing and insightful beings. A Pisces person will grasp a prospects imagination and take them on a fanciful ride. Although, Pisces people are sensitive, their intuition guides them towards the appropriate prospects and long-term partners. It won’t be difficult for a Pisces to let their guard down, but they can determine a person’s character after one conversation. Leo, Gemini, and Virgo people do not mesh well with a Pisces. If you are a Pisces person searching for a compatible casual encounter, find an Aquarius, Taurus, or a Libra. Compatible long-term relationship zodiac signs for a Pisces include Cancer, Scorpio, and Capricorn. Flirting With a Pisces Guy - Meet Mr. Seducer. The dreamy Fish belongs in a romance novel and is truly a fish out of water in the real world. Just when you think you are flirting with a Pisces, he slips away to the next seduction. He’s not a tease or a cheat, just an odd character that loves a fantasy and never stops looking for one. Pisces love mysterious women and inexplicable passions. They love the unknown and unknowable. Flirting with the Fish requires a seductive appearance and attitude. Don’t be loud, silly, chatty or obvious. Pisces are deep and puzzling. Move in the shadows and stare right through him. Be totally confident in your sexuality and blatantly sensual. Don’t fear giving him the once over and then walking away. Don’t fear approaching him and asking him his name and then leaving the conversation to hang in silence. Be a contradiction. Be coy and then brazen. Withdraw into the corner and then plant a kiss on a friend’s cheek. Flirting with a Pisces is a lot like a dance in some sizzling old Hollywood movie. Don’t forget that the guy is filled with emotions. Don’t hurt his feelings or wound his ego. Let love and romance be the potion that brings him to his knees. You are not dealing with a logical mind but a beating heart. Pisces rules the feet and the immune system. He is about growth, development, protection and death. Pisces is concerned with the evolution of the soul and has little connection to reality.